Share this crowd-pleasing recipe with your friends and family. Wash, dry, and cut broccoli florets into bite-sized pieces. 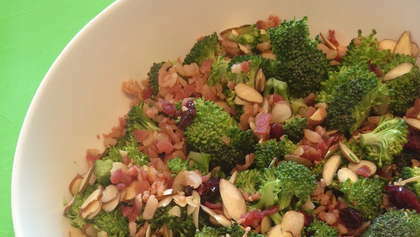 In a large bowl, combine broccoli, chives, and cranberries. In a small bowl with lid, shake the oil, vinegar and sweetener until mixed. Drizzle over broccoli and toss to coat. Sprinkle with sliced almonds (or sunflower seeds) and bacon bits.